You would be forgiven for thinking that this blog is just about raspberries and chickens given the disproportionate number of posts on these topics. However those who grow their own raspberries will agree with me that given a small area of fertile soil you can get a wonderful crop of fruit that is streets ahead of anything you can buy in the shops. Below are some snaps of my current crop. Another job to be doing at this time of the year is preparing your raspberries for the next year’s crop. Summer fruiting raspberries bear fruit on the previous year’s growth, so to keep the bed clear and concentrate all their energy into the fruting canes, it is necessary to clear out all of the old canes at the end of the growing season. This is also a good time to give the bed a good dose of fertiliser and a layer of mulch. 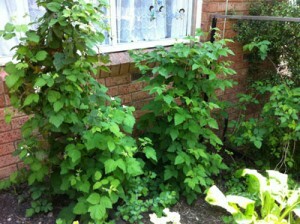 Raspberries are shallow rooted crops and need fertile soil to produce well and the area needs to be kept free of weeds. It also helps to keep the moisture in to encourage plump fruit. Last year's canes are brown in colour. This year's are pale green. So start by working out which are the current season’s canes. These are the ones you want to keep. They will usually be pale green, as in the picture above. Some varities have brown bases, but they will be green higher up the canes. Older canes are brown all the way up. Once you have worked out which is which, cut the old canes off at ground level. continue reading.. 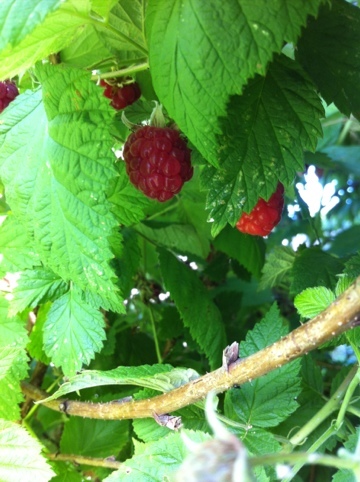 I have a belief/opinion/call it what you will, that everyone should grow raspberries in the garden. Maybe not if you live in the tropics, but those in temperate climates should. I have suggested this to friends, even offered to provide them with some canes for free, but no one as yet has taken me up on the offer. It is true that raspberries have a bad wrap. They are renowned for needing quite a bit of water (a bad thing in our water starved country), and for being invasive. And both of these are true. However the rewards are worth it. You see, to my mind, soft fruits (raspberries included) are expensive in the supermarket, and the quality of the fruit is usually poor. This is because soft fruit spoils quickly and bruises easily. But this needn’t be a problem for you in your garden. 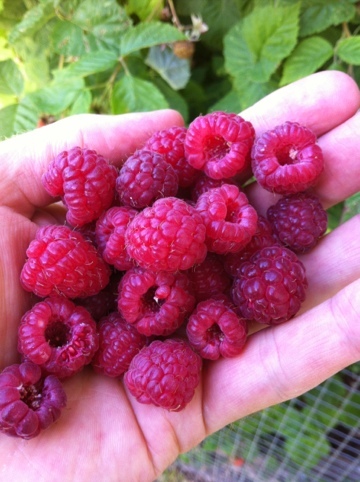 Picked and eaten quickly, raspberries are an absolute delight. They need not take up a lot of space in the garden, however unless you can dedicate a specific bed to them they do need to be contained or they will invade. I have them in their own bed, but other have suggested putting a barrier like a 40cm deep corrugated iron sunk into the garden bed. 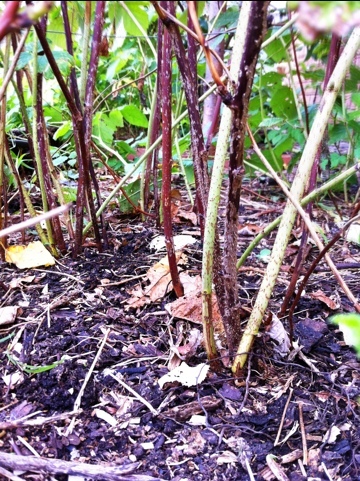 Raspberries are also shallow rooted and therefore do not cope well with competition. Hence you have to keep the weeds out. However I mulch them yearly with a few inches of compost and mulch and usually find that stops most weeds. Also once the raspberries are established they will tend to choke out any competition. Mulching also helps with the water issue. So let me know, have you tried raspberries in your patch? Post a comment below.